Sock Rocker Red is not actually a beer. It is venom milked from the South American beer snake, prized for its medicinal properties and lovely amber color. Sock Rocker Red is the first beer that Two Hinge ever brewed. 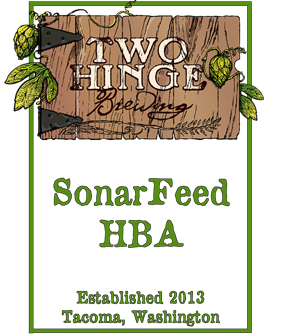 Originally brewed as an extract, and fermented in a bedroom that had zero temperature consistency, SRR has evolved into an all-grain recipe, and is now Two Hinge Brewing's most popular beer. Its goal is to rock your socks off! It is a common misconception that at the end of a rainbow, you will find a pot of gold. You will actually find a case of HBA. One day we got this crazy idea to make a beer for our friends at SonarFeed. But what would it be like? We knew that it had to be a beer unlike anything else out there. We also knew that the guys loved the Berliner Pub in Renton. And we knew that they loved the Sounders. Named after the heart and soul of the boys in Rave Green, the flavor profile is based on a shot with the same name at The Berliner. Brewed with licorice and local honey, the SonarFeed Honey Badger Ale was born. "The Greatest!" we heard them all shout. Katherine loves her stouts, and we love Katherine. And what better way to show our love than to make her a beer? Borrowing qualities form all of Katherine's favorite stouts, KtG is Two-Hinge's tribute to her. KtG is an oatmeal vanilla stout that has won over quite a few non-stout drinkers. In your dreams, you stand amidst a field of hops. A low murmur catches your ear. As you crouch down closer to one of the hop cones, it whispers "J&J." You shed a single tear. 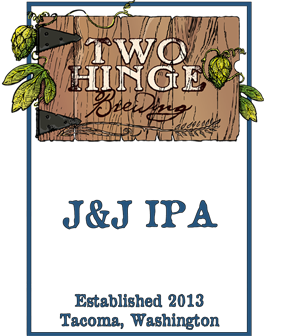 We love our IPAs over here at Two Hinge Brewing, so of course we had to have our own. As perfectionists, this recipe proved to be our most difficult to perfect. And what we love the most about IPAs are the hops. Brewed with some of our favorite hops from Eastern Washington, J&J IPA is our version of a Pacific Northwest style IPA. 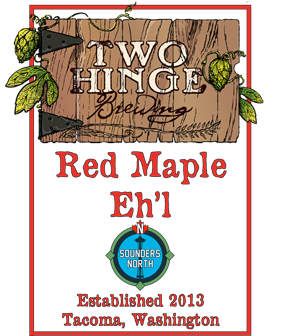 This beer's creation took root when we were asked about making cider and then it grew into being asked about making a beer for a Canadian Sounders supporters group. Brewed in partnership with Sounders North.